Where is your focus today? Do you feel like you are being consumed with the trials of your life? Do you welcome each situation with excitement and joy? Do opportunities appear to be impossible? We often hear metaphors like…"fighting the fires of our lives," "going out on a limb," "coming to the edge." As a Sundoor certified FIREWALK INSTRUCTOR, leading thousands of people in this ritual of personal empowerment, I have a different perspective I invite you to consider…. You CAN move through life without a burn, or, even if you do get burned, it’s no big deal because it heals like a minor scratch or bump with an incredible lesson, a pearl of wisdom, and a new level of awareness for you. Perhaps life is happening the way it is because the Universe, Spirit-- that which is greater than us--knows that you have the capacity to make a contribution to yourself and others. Life happens, we have no control over it. The true gift is how we process it, take action, and integrate its lessons into each step. That is what the firewalk ritual is about. Yes, it is about walking on 1200 degree burning embers, and, it is a ritual with historical roots around the world, and, continues because of the profound teaching and healing it provides, even if you don’t walk on the coals. What’s more is that firewalking is about noticing your thoughts individually and as a community, feeling your fear and hesitation, and then using that energy to move you forward rather than immobilizing you. It is training in surrender, focused intention, trust, and community support. It is a ritual that asks, "Where do we stop, where do we go unconscious and think someone else is going to do it for us?" These are all very important questions that we have before us as a community. Most of you who are reading this are of adult responsibility, and it is time for us to take a stand about how we do life and how it serves as a model for our children. If our children are doing drugs, saying yes to the things that can harm them, experiencing low self-esteem and seeking groups that are detrimental to themselves, then it is time for us, as elders, to create a rite of passage. It is time for us as the elders to walk through the fire and show our young ones that life is possible in a very empowered way. And that the source of a great life is within a powerful internal guidance system. Feeling good and high is out of doing things that empower us, moving with our fears and taking a stand for what will sustain us in the long run. I invite you to walk the fire, to consider another perspective, and ask, what is your perspective? 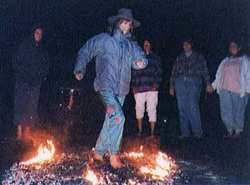 For more information about future firewalks, contact Charlotte.